This action calendar announced actions and events for 2012-2013. Doctoral Students Council plenaries, CUNY Board of Trustee meetings and Free University Week are some of the highlights. Occupy CUNY organized around fighting the militarization of CUNY campuses, and the privatization of education. CUNY Students rallied against the Board of Trustees to oppose pay scale increases for top administrators, and tuition hikes. In addition, students collectively organized pop-up universities, direct action teach-ins, hacking spaces and general assemblies at the Graduate Center and in public spaces. Rights | Copyright Occupy CUNY and Doctoral Students Council This work is licensed under a Creative Commons Attribution 4.0 International License. 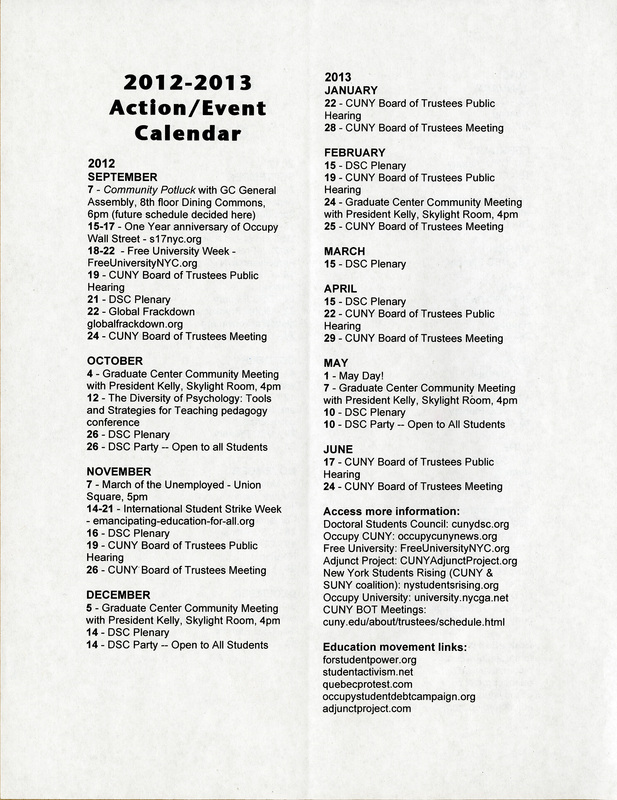 Cite This document | Occupy CUNY and Doctoral Students Council, “Action Calendar ,” CUNY Digital History Archive, accessed April 24, 2019, http://cdha.cuny.edu/items/show/6432.